What close encounter have you had recently? Close Encounter of the 1st Kind: I've seen the light from an unidentified Expo. Close Encounter of the 2nd Kind: I was able to make out the size, shape, speed and distance of an unidentified Expo. Close Encounter of the 3rd Kind: I had an actual sighting of an Expo life form. Close Encounter of the 4th Kind: I had physical contact with an Expo life form and/or entry on board an Expo shuttle bus. Close Encounter of the 5th Kind: I experienced being transported in an Expo shuttle bus craft to the actual Expo of the Expo beings. 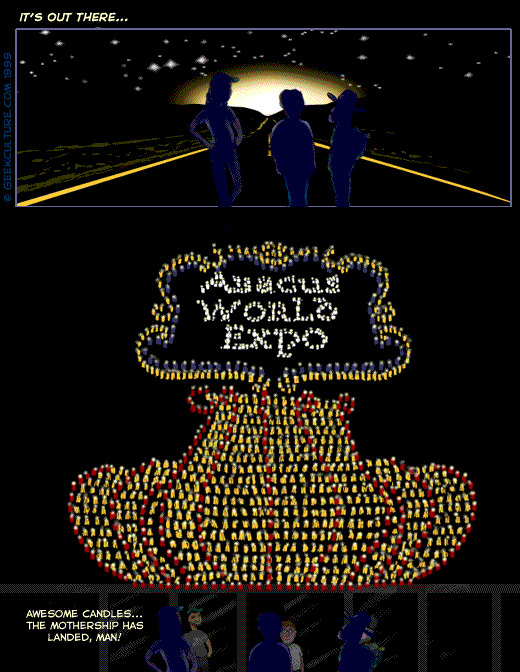 Abacus World Expo t-shirts are ready for ordering! Shirts will start shipping Wednesday, order yours now! We moved #aftery2k from Undernet to irc.slashnet.org. Come on over and say hello!